Halfway through daily errands, I bought two quinces, a new-to-me fruit. When I got back in the car after the next stop, the air inside was perfumed with a powerful aroma, reminiscent of pineapple and very ripe apples combined. I planned on cooking the quince that night. When I got home, I left them on the kitchen counter. Soon, their lovely fragrance permeated the kitchen. I couldn’t wait to cook with quince. For several years, I’ve been meaning to make Pork and Quince Stew, an old-time recipe on the Northern Aegean island we call home. It wasn’t until I read, in quick succession, Mariana’s recipe for Stuffed Quince and Ioanna’s recipe for Beef and Quince Stew that I was inspired to set out on a quest for quince (found in Carr’s specialty produce section). When I cut the quince open and tasted a thin slice, I was disappointed. The flesh was firm and disagreeably woody, and its flavor was astringent and unpleasant. I was confused. How could fruit with such an amazing aroma taste so bad? 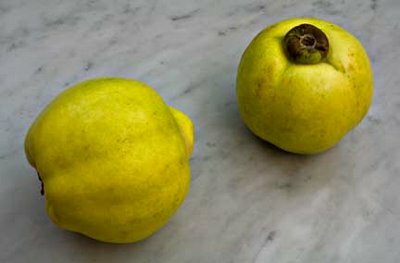 When buying quince, Schneider advises to choose large fruits with a smooth and regular shape, which makes them easier to peel. Because the firm flesh is difficult to cut, it’s important to use a sharp knife. Schneider says that “quinces bruise easily, [but] last for months” if they are tightly wrapped in plastic and kept in the refrigerator. On the island, quinces were traditionally packed in sawdust and stored in north-facing rooms. This kept the quinces fresh until the family pig was slaughtered in late December or early January. Having determined that cooked quince can be tasty, the next step was developing a stew recipe. As I perused my Greek cookbook collection, I found a multitude of recipes for Pork and Quince Stew (called Kydonato in Greek), all of them different. Some were seasoned only with bay leaves, others contained cinnamon or cloves or nutmeg or allspice or a combination of several spices. Some used dry red wine, others sweet red wine, and still others white wine. Some recipes were rich with onions, others warned not to add onions, lest they overshadow the quince flavor. I ended up creating my own recipe for Pork and Quince Stew, taking guidance from a variety of recipes and seasoning it to please our palates. My husband has never been fond of fruit and meat, nor is he keen on cinnamon in savory food. Since I was intent on using the quinces, I left out the cinnamon and instead flavored the dish with allspice, nutmeg, bay leaves, and lemon peel. Pork and Quince Stew was a great success. The flavors were savory and not overly sweet, and the quince was a lovely complement to the tender pork. We both enjoyed it thoroughly. My husband added dashes of Jamaican hot sauce to his serving. I was persuaded to try the stew with a little hot sauce and was surprised by how good it tasted. I wouldn’t cook the stew with hot sauce, but I’d definitely serve it on the side for spicy food fans.